Pulmonologists are doctors who are specialized to deal with lung disorders. They treat acute and chronic lung conditions, and chest diseases such as COPD, asthma, bronchiectasis and respiratory infections. Pulmonology is a subspecialty of medicine and needs extensive training. Dr. Khan has extensive experience in the field of pulmonology. He is an MBBS doctor, with DTCD, MRCP , FRCP. He is a competent professional, trained to deal with smoking complications like emphysema, and other lung conditions such as asthma and interstitial lung diseases. He deals compassionately with his patients, and can be reached through oladoc.com for appointment, or at his clinic, Islamabad Specialists Clinic, in F-8 markaz. Dr. Fazal-e-Akbar is another big name in pulmonology in Islamabad. He is a critical care physician, as well as a specialist pulmonologist. He holds membership in College of Physicians & Surgeons, British Thoracic Society, Royal College of Physicians, Pakistan Chest Society and European Respiratory Society. He competently deals with complex respiratory infections and lung conditions. He can be sought for appointment at Quaid-e-Azam Hospital, Hillal Road and Maroof International Hospital, F-10 markaz. His has the following degrees: MBBS, MRCP, FCPS (medicine), FCPS (pulmonology, CCT). Available for consultation at Uppal’s Clinic, F-7, Dr. Uppal is a highly qualified Internal Medicine Specialist and Pulmonologist. A graduate of Army Medical College, Dr. Uppal holds the following degrees: MBBS, MCPS, MRCGP, MARH, and FCPS. He is a member of PMDC, Royal College of General Practitioners (UK), and Member Alliance of Registered Homeopaths (UK). Not only is he a competent physician, but also a great inventor—he holds two patents, for a cardiac and a respiratory device, designed to help patients with high altitude. He has been practicing medicine for 24 years and also dabbles in alternative medicine and homeopathy. 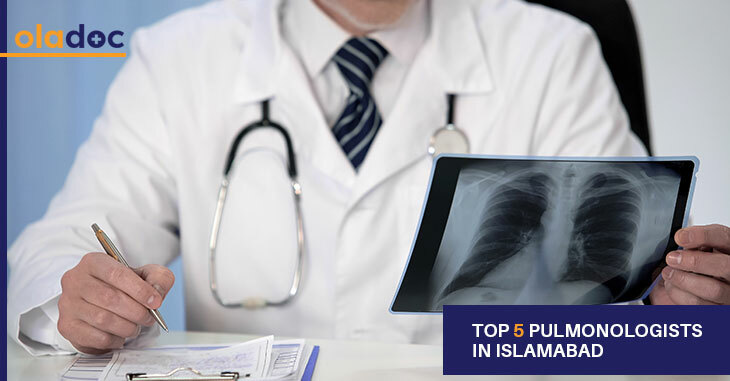 Dr. Awan is one of the most competent doctors in the field of pulmonology in Islamabad. He deals with chronic lung conditions such as emphysema and bronchitis, asthma, respiratory infections, tuberculosis, among other lung conditions. He has an MBBS, and FCPS degree, along with MRIT, DTCD and FCCP. He can be reached for appointment at the Islamabad Specialists Clinic, G-8 markaz. Dr. Kausar is a well-known name in pulmonology. She is an MBBS and FCPS qualified internist and pulmonologist. She is well-versed in the diagnosis, prevention and treatment of lung diseases as well as other chronic issues such as diabetes. She is available at Islamabad Specialists Clinic, F-8 markaz for visitation. You can book an appointment with top pulmonologists in Islamabad, Lahore and Karachi through oladoc.com, or call our helpline at 042-3890-0939 for assistance to find the RIGHT Doctor for your concerns. « How Toxic Relationships Take A Toll On Your Mental Health?